Portable Openwith Menu. A definite new highlight is the POM. A single click or key shortcut (Ctrl+Alt+Enter) will popup a context specific menu presenting an array of applications to open the currently selected file(s) with. This menu draws its contents from your Portable File Assocations setup, so it is portable as well, and utterly easy to manage. 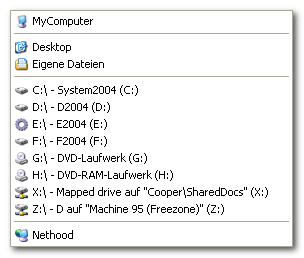 As you see, the application associated by Windows (in this example ACDSee) is also shown in the menu to give you all the choices you might need. Last not least, all of this is just a click away: (toolbar button). Flexible Width Tabs. Flexible width for named tabs saves precious screen space. 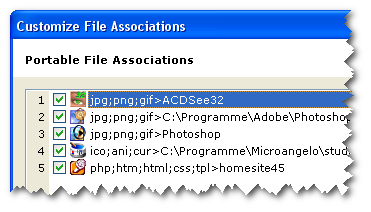 Associate Files with Scripts. XYplorer's Portable File Assocations (PFA) learned to deal with scripts. This PFA copies the version number of any double-clicked executable to the clipboard! Popup MyComputer. A practical new toolbar button pops up a little menu with your computer's top locations. Favorites with Captions. "Transparent PNGs" is a little easier to read than "E:\Development\TestFiles\Media\Image-Formats\trans\png\ARGB 32bit\", ain't it? New command "Copy Item UNC Path/Name(s)". Copies the full path/name of all selected items, using the UNC path for items located on a mapped drive. If your are working in a network you'll love this one.